Congrats to Caspar on a comprehensive Victory! Congratulation to Caspar for the victory and to Brent for having reached the final. A non-obvious result, given the quality of the contenders. Both players played aggressively in both games. Just a curiosity. 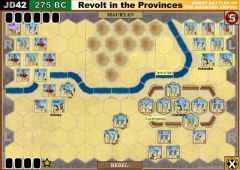 It seems to me that in the first battle a supported light cavalry unit was eliminated by a 3 triangle 1 flag roll... Am I mistaken? Edit: Yes I was! With my eyes aging, it's time to move to module version 4.0 with its thickest border units. Congratulations Caspar on a well deserved victory. There was some luck but there always is. Blowouts like these are well beyond luck. My head wasn't in it and coupled with your excellent play there was only ever going to be one result.....my apologies for not giving a better showing than you and these matches deserved. First Strike is necessary in the metagame to create uncertainty for the attacker and I wouldn't remove it....it's certainly less powerful in Ancients than it is in some of the other C&C games. Congratulations Carthage! Hail to the new King! Thanks to Mark for the organisation and all nice people with whom I had the pleasure to play during these months. clearly your First Strike rolls are more successful than mine..
First Strike is that thing that gives a small hesitation to plans. Compared to the random imbalance of the dice and other cards like Cavalry Charge & Double Time, First Strike is not the big offender in my view. I can tell you I've played 19 consecutive matches without drawing First Strike or Double Time, and won 12 out of the 19, so I think it isn't that big a deal. The Syracusans march towards the enemy using some line commands. 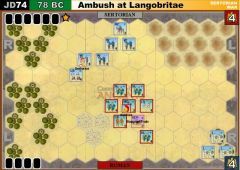 The Carthaginians counter the advance with a mounted charge on the light foot units that are the moment blocked from retreating by the heavier units behind them. 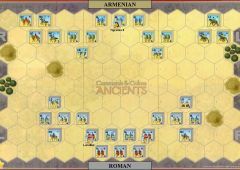 The attack gets repelled without major casualties on either side. 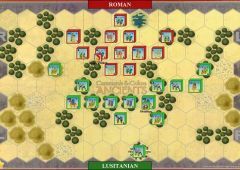 The Syracusan right flank under Leptines eliminates the Carthaginian heavy cavalry by cutting off its retreat path. 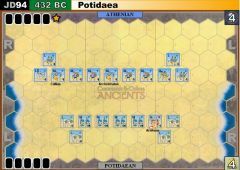 The Carthaginian response gets thwarted by a first strike. Leptines goes one and pressure the right flank until units from the center come to their aid but at that point the battle is already won. The Syracusans advance again in line formation. 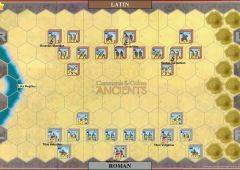 The Carthaginian content themselves with harassing the Syracusans the their missile units. 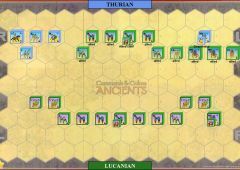 The Syracusans on their left spot a weakness in the Carthaginians formation and engage it killing some of the light units. 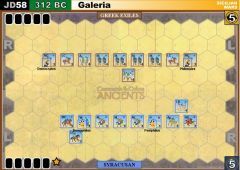 The Carthaginian respond with their chariots and manage to push the Syracusans back and killing on of their phalanxes. 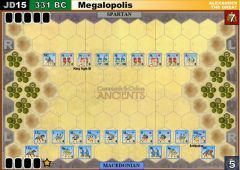 The left ends in a stalemate between the chariots and some barbarian warriors that do not seem to be able to over power each other. 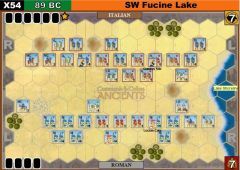 In the meantime the rest of the Syracusan forces have advanced and are experiencing constant missile barrages. 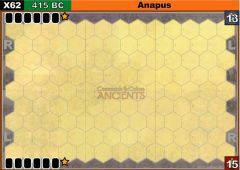 Leptines takes the initiative by joining the auxiliaries on his flank, attacks the Carthaginian auxiliaries and dies doing so. 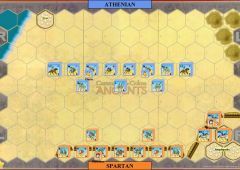 The Carthaginian heavy cavalry supports now the auxiliaries but the Syracusans are still eager to finish them off but by now the chariots on the other side have refound their courage and driven the barabarian warriors off the field. Thank you very much BrentS for these games, especially when the draw was in my favour. And thanks Mark for the organisation. I would like to suggest banning (or at least nerfing) the first strike card in the OT, it just seems very powerful and against the nature of the game to be able to mess with the opponent on his turn.